Tampa Bay Downs in Florida has barred the entries of trainer Horacio Barbaran for allegedly violating the track's anti-slaughter policy. Officials at Gulfstream Park were notified of the move and said they will not permit Barbaran to stable or race at the South Florida track, either. Peter Berube, vice president and general manager of Tampa Bay Downs, said the exclusion of Barbaran – who did not have stalls at the track but shipped in from Ocala to race – is indefinite. The alleged violation involves the Florida-bred 6-year-old Admiral's Cruise gelding Win Cruise, bred and owned by Santa Cruz Ranch. 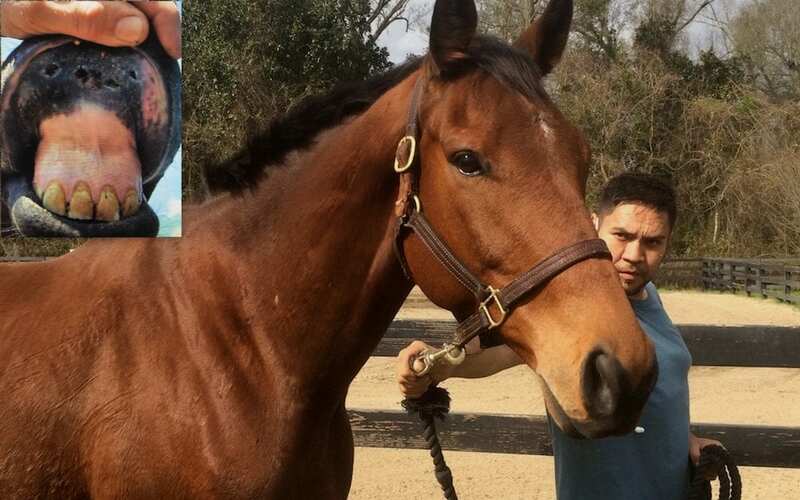 According to Berube, veterinarian Elizabeth Rees notified Tampa Bay Downs officials on Dec. 30 that she had been at a Louisiana “kill pen” in September and rescued a Thoroughbred whose lip tattoo had been burned off to conceal its identity. Kill pens are where horses are kept prior to being transported to Mexico or Canada for the purposes of slaughter. Rees requested a DNA test from The Jockey Club, Berube said, and the horse was identified a few weeks later as Win Cruise, who last raced at Tampa Bay Downs April 24, 2016 – his second of two career starts. The Coggins certificate, identifying the horse as “Bill,” was signed by Dr. Charlotte Dow of Williston, Fla.
“The owners, Santa Cruz Ranch, were contacted, and they indicated they had given the horse to Horacio Barbaran in its entirety,” said Berube. “He confirmed that took place Aug. 29, 2016. Henry Ferro, an Ocala, Fla., attorney representing Barbaran, told the Paulick Report on April 11 Barbaran never owned the horse. The Stanley Brothers are well-known operators in the livestock and slaughter world. No action was taken against Santa Cruz Ranch. The policy in the Tampa Bay Downs condition book, Berube said, bars any owner-trainer or trainer found to directly or indirectly sell a horse for the purposes of slaughter. Barbaran, formerly a jockey in his native Peru, has been training in the United States since 2003. He has started 1,258 runners during his career, with 83 winners. As for Win Cruise, Rees said she has been training him as a jumper and he is getting ready for his first horse show next weekend. She said she spent $80 for the DNA test, $1,350 to get him out of the kill pen and $450 for quarantine. “Maybe owners/breeders need to know how costly it is for other people to clean up their messes when their horses end up in kill pens,” Rees said. This entry was posted in NL Article, Ray's Paddock and tagged anti-slaughter policy, dr. charlotte dow, dr. elizabeth rees, Horacio Barbaran, Horse Slaughter, jack darling, peter berube, santa cruz ranch, stanley brothers, tampa bay downs, win cruise by Ray Paulick. Bookmark the permalink.